Ziggy is a dog who has never been on a boat before. 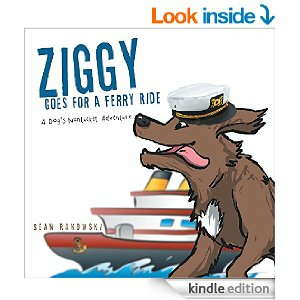 When his family decides to take a vacation to the island of Nantucket, Ziggy finds that riding on a ferryboat is quite an adventure! Sean has lived with pets his entire life and thus has accumulated a lifetime's worth of animal stories. Sean and his wife, Kate, currently have two horses, four cats, and two dogs - one of which is Ziggy, the star of this particular adventure, as well as many others. Sean decided long ago that growing up was no fun at all, so he wishes to share his accounts with an audience that will most appreciate them: other kids-at-heart (and their children). Sean and Kate reside in Hartland, Vermont, which is a lovely place to raise a family of fuzzy, four-legged children.